Join 1,500 of your fellow runners for the 41st annual St. Patrick's Day Road Races. Choose between the 10K and 2 Mile Run/Walk. All events are timed this year! Fill the 'Ville with Green! Come join the grand celebration. 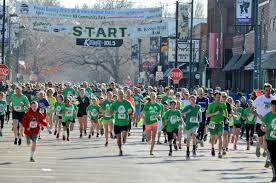 It's the 41st running of the St. Pat's Races in Aggieville. One of Manhattan's largest running events, it has drawn record numbers of walkers and runners. Topping 1,200 participants each of the last four years. Find out everything you need to know about the race. Ready to take the next step? Join the fun and sign up.